To hear Willem Dafoe (Spider-Man) tell it, there was no way he wasn't going to work on Walt Disney Pictures' 3D sci-fi fantasy John Carter with Academy Award®-winning writer/director Andrew Stanton. "My character, Tars Tarkas, is the head of a warrior tribe called the Tharks," he explains. "They are very tall, green-skinned Martians with four arms and tusks. There's a feeling that their culture is in decline; they were once a great society and now they've been reduced to being a nomadic, warlike society, moving from place to place to survive. There's a feeling of sadness and lost empire to them and it very much informs who Tars Tarkas is. The Thark culture is brutal, primitive and warrior-like, but it hasn't always been. Tars remembers a more refined, civilized past. He secretly yearns for those days and for a more humane society. He knows there's got to be a better way than how they're surviving now." The challenge for Dafoe and the other actors playing Tharks was to convey the depth and feeling of their performances while adapting to the technological and physical realities of performing in this particular project. Dafoe and his fellows Tharks spent their time on set dressed in gray jumpsuits covered in black dots and on stilts. They also wore helmets with cameras mounted on them; the cameras were pointed at their faces at all times to capture their expressions. "This film had lots of challenges, not only because of the stilts, but some of the gestural language and the fact that we had to learn a Martian language for part of it," Dafoe says. "I trust Andrew a lot. I know him from working on 'Finding Nemo' and I know that he's quite rigorous and quite detailed. He was very insistent that he wanted scenes played out for the human characters, and also to always have the scenes fully realized. So, I'm in all of the scenes with Taylor Kitsch, who plays John Carter," he says. "It's not just motion capture on green screens. And it makes a big difference. It's a big difference for the actors because everything is informed by the set; it's not disjointed. It gives a kind of integrity for the animators to work with as everything holds together as a piece. I think that's very important. I'm not sure that's ever been done to this degree." Dafoe is also a huge fan of the story that Edgar Rice Burroughs created (from which the film was based) back in 1912 and believes that it has stood the test of time extremely well. "This is a very well imagined world that Edgar Rice Burroughs has created," he says. "It's got all the attraction of that imagination plus pure fantasy. The story he tells really is very evocative, the characters are so well drawn and it puts forth some questions about society and how we conduct ourselves. It asks what our ambitions are and what we're willing to sacrifice. It's rich material. "I can imagine that the film will work for a very broad audience. It works on lots of different levels because it's complex, it's dense and it's very detailed. One of the biggest pleasures in doing this project is to work with someone like Andrew Stanton who works on this scale, on a story that has popular appeal but doesn't pander. 'John Carter' was created from a very personal place," Dafoe concludes. "John Carter is a sweeping action-adventure set on the mysterious and exotic planet of Barsoom (Mars). 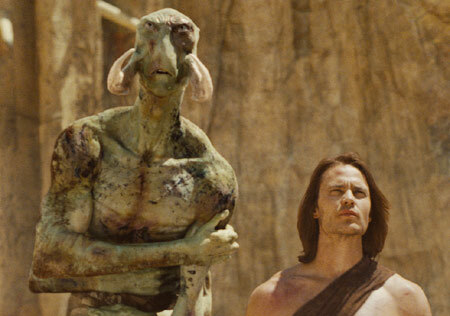 The film tells the story of war-weary, former military captain John Carter (Taylor Kitsch), who is inexplicably transported to Mars where he becomes reluctantly embroiled in a conflict of epic proportions amongst the inhabitants of the planet, including Tars Tarkas (Dafoe) and the captivating Princess Dejah Thoris (Lynn Collins). In a world on the brink of collapse, Carter rediscovers his humanity when he realizes that the survival of Barsoom and its people rests in his hands. Opening across the Philippines on March 9 in IMAX 3D, Digital 3D and regular theatres, John Carter is distributed by Walt Disney Studios Motion Pictures International through Columbia Pictures.